The 2016 GNU B-Pro is all about control. Control in the park, control outside the park, and control in variable conditions. It would probably safely drive your car down an icy mountain pass if it could reach the pedals. We found that the control inspired confidence. Confidence to try new tricks in the park, charge when the terrain is sketch, and to basically take our snowboarding game to the next level. 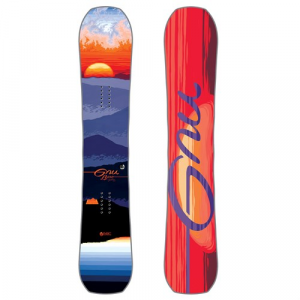 Barret Christy’s GNU B-Pro snowboard has been around for years. In fact, we have an 8 year old model hanging around the office that belongs to our marketing director and she says it was all about control back then. While we can’t call out that the 2016 GNU B Pro did any one thing amazingly well, it is because it was pretty darn great at everything we threw at it. It continues with its C3 camber. C3 is a rocker/camber combo that is camber dominant. Basically, it’s mostly camber with a little bit of rocker thrown into the middle. 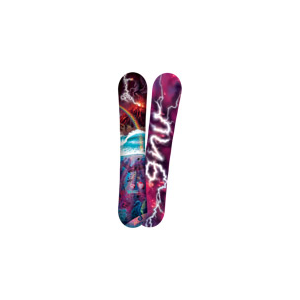 The rocker provides a little bit of playfulness into a very stable snowboard. In all, we recommend this to every level of rider. The beginner and intermediate riders may have the most to gain from it because its superior control allows you to stop worrying about edges and concentrate on having fun. 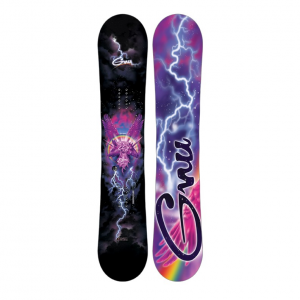 The most refined board in women’s snowboarding. Barrett began working on the B-Pro with a focus on pipe and park championships. Riding Crested Butte, Vail and Mt Baker, free riding, deep pow and the Baker Banked Slalom were always on her design radar. Constantly tweaking and refining this board over the years with Gnu’s design team has landed this board on the podium in every event imaginable. The B-Pro is guaranteed to win the day at your local mountain. Proceeds support Boarding For Breast Cancer. Art by Adam Hanes.